The UCLA community school will be teaching a seminar class called STEM to Stern. Using a STEM (science, technology, engineering, and math) based curriculum provided by REACH, the US Sailing’s STEM education program, there will be a classroom filled of knowledgeable high school aged sailors ready for the summer. Our volunteers (YOU!!!) will go through standard SAIL trainings as well as following the REACH curriculum. Conveniently, there will be the same number of SAIL volunteers as students in the community school seminar. This will allow each volunteer to be paired with a student, forming a “skipper” and “first mate” team, which will also double as a mentorship opportunity. These will also be your first mates up at camp. By the time your week at Big Bear comes around, you already will have yourself a scallywag, Pirates of the Caribbean-esque ready sailing crew! If you aren’t quite ready to jump on board, but don’t want to abandon ship, feel free to contact us at sailpds@unicamp.org! You’ve said you could never do WALL. You’ve done camp before. You’ve made the posters with your units and joined your whole session at the bridge for the send-off. Three days later, you’re back on the bridge watching the WALLers hiking back looking a lot dirtier. So where do we go? What happens during those four days, and what do we teach our campers? W.A.L.L. is a challenging hike that promotes teamwork, perseverance, and a chance for success. It pushes anyone who goes on the journey and gives them an opportunity to get outside their comfort zone—sleeping in tents, hiking with heavy packs, and looking out for one another. We carry everything we need on our backs from our food to our tents. W.A.L.L stands for Wilderness Adventures in Leadership and Learning. 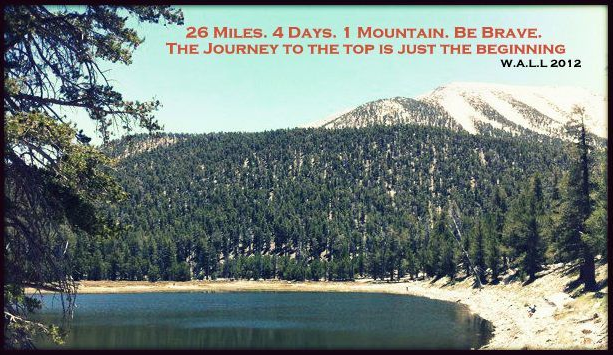 And after this 26-mile, 4 day journey to the highest peak in Southern California (Mt. San Gorgonio), you will have witnessed your campers step up as leaders and most importantly, learn what they are truly capable of achieving. Being a part of that is truly magical and signifies what camp is all about. And if you’re wondering what we do, you might have guessed it —we walk a lot. All that walking gives us an opportunity to talk, make silly jokes, enjoy breathtaking views, and get to know each other better. We set up our campsites, sit around in a circle to share stories as the sun goes down, star gaze in the evenings, and sometimes have our food stolen by chipmunks. As an advisor, your role is to prepare, train, and support your campers to get to the furthest point they can reach. You become a coach, friend, nurse, entertainer, and parent all rolled up into one.